Aikido is a modern technique of martial arts from Japan. The founder is Morihei Ueshiba (1883 - 1969). The syllables Ai, Ki and Do have the meaning harmony (Ai), vital energy (Ki) and way (Do). Aim of Aikido is to restore the perturbed harmony. The force of an attacker is leeded, amplified and redirected back. The movements are natural forms of circles or helixes. Besides physical practise, Aikido teaches all humans to do actions in harmony. Content of the Aikido training are a specific body training, medidative elements, exercises for concentration, breathing and falling. Strength and body height hardly play a role. In Aikido there is no competition. Instead, there are external courses for every member. The Aikido training starts with functional gymnastics which prepares the body to the following training. Also, it is good for fitness. An important part of the lessons are sidestep exercises and falling techniques. 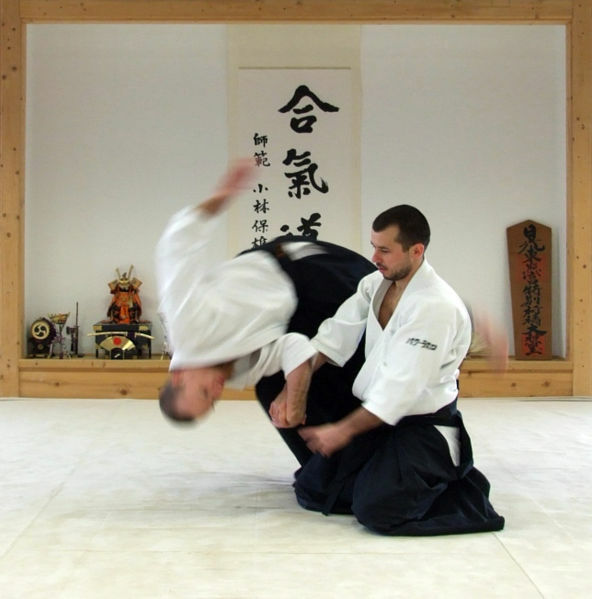 Aikido techniques are practised in a harmonic manner and with respect to each other: one partner plays the role of an attacker, the other one the defender. A steady training improves the techniques which is important to use it fast and reflexively during a real attack. Aikido is applicable for every age, men and women.